Turns out that Irish soda bread makes great grilled and toasted sandwiches. 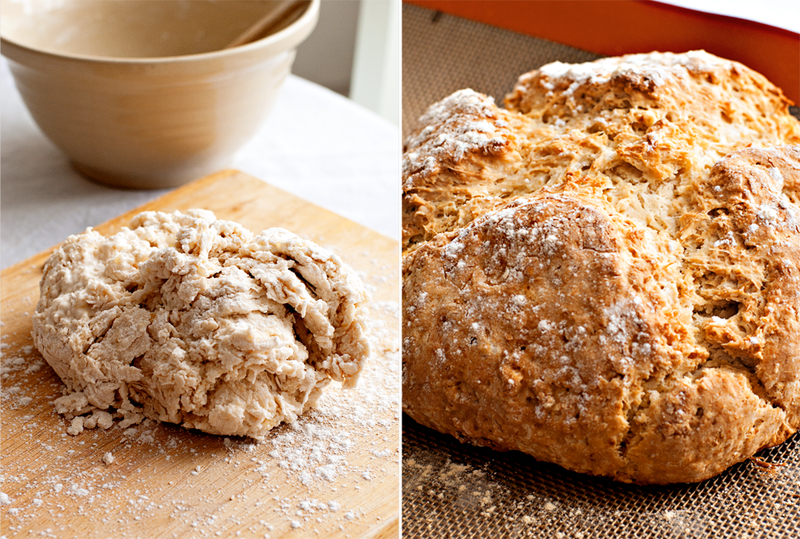 When in Ireland, I might take some day old soda bread, top it with cheese and sliced tomato and slide it under the broiler for a late night snack. 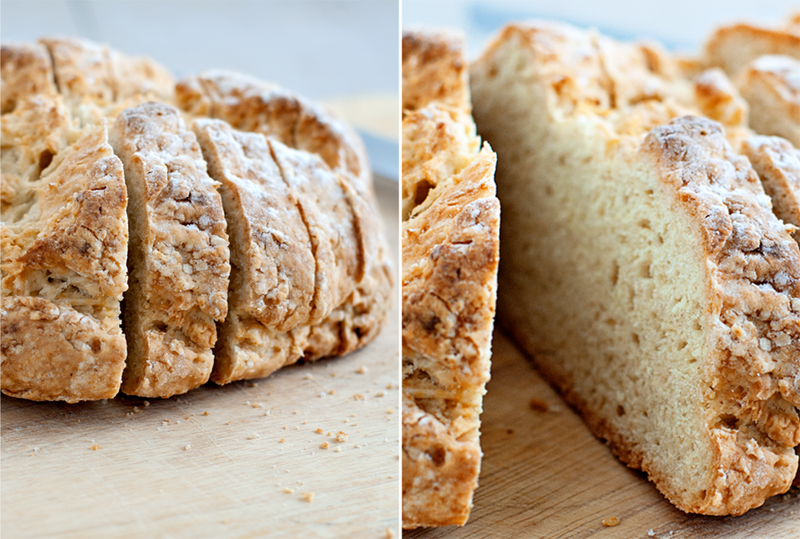 But, til now, I'd not ventured into sandwich making with this versatile bread. The bread recipe could not be simpler. Preheat oven to 375° F. Place 2 cups all purpose flour, ¾ teaspoon of baking soda, ½ teaspoon salt in a medium sized bowl and combine. I sift these ingredients together to make sure they're well incorporated. In a small bowl, combine 1 cup of buttermilk that's been well shaken or stirred with 2 tablespoons of melted butter. Add the liquid mixture to the flour mixture and stir just until a loose dough is formed. 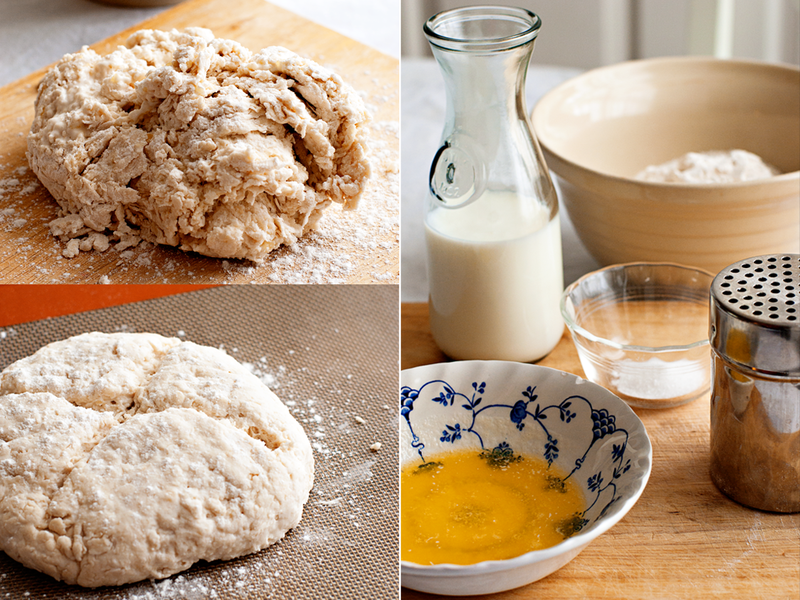 Turn the dough out onto a well floured surface and with floured hands, knead just a few times. Shape the dough into a six inch mound and cut two, deep slashes in the form of an X on the top. Dust the top with a few sprinkles of flour. Place the dough on a baking sheet (dusted with flour) and bake for 30-35 minutes or until the dough sounds hollow when tapped on the underside. Remove to a baking rack to cool. When the bread has cooled, cut yourself a few slices, butter them and grill them under a broiler or in a grill pan. 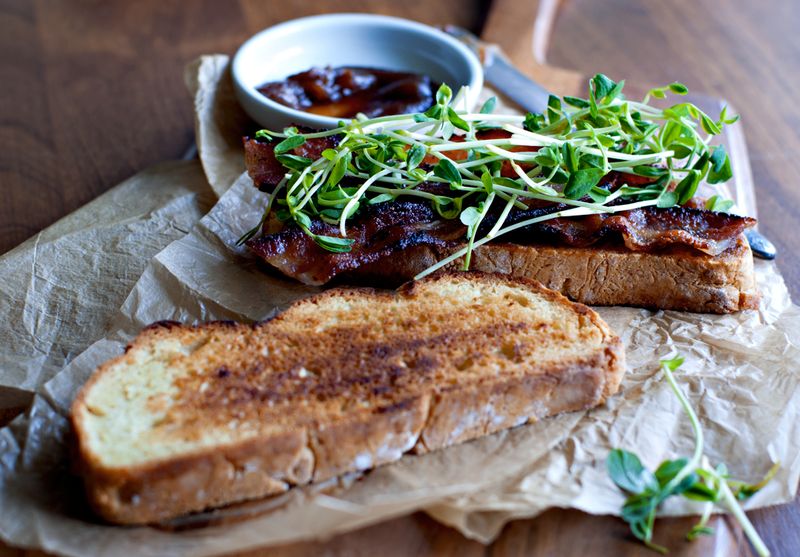 To build your sandwich, simply add a layer of apple butter to each slice, then top with good quality bacon (I used apple wood smoked bacon; Irish bacon would be ideal), and a layer of bean sprouts for a little bit of green. Slice, and devour. 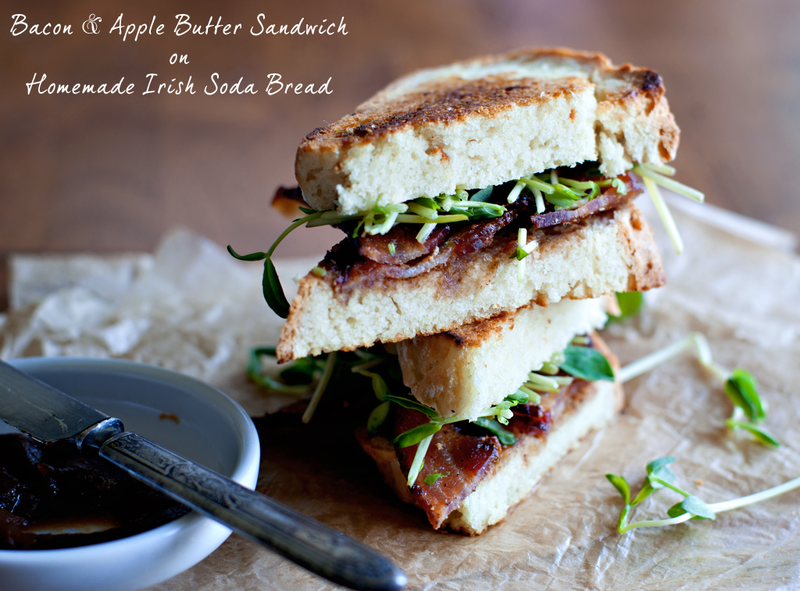 It's no revelation that pork and apples pair well together - but it doesn't end there with this sandwich. The textures are also pleasing - the crunch of the bacon against the silky smooth apple butter. I think you'll really enjoy this combination of flavors and textures. I snacked on this sandwich while watching the recent Tyrone v Mayo All Ireland Senior Football semi-final match...unfortunately, Tyrone ended up on the wrong side of the score, but they had a great season nonetheless. On to next year!